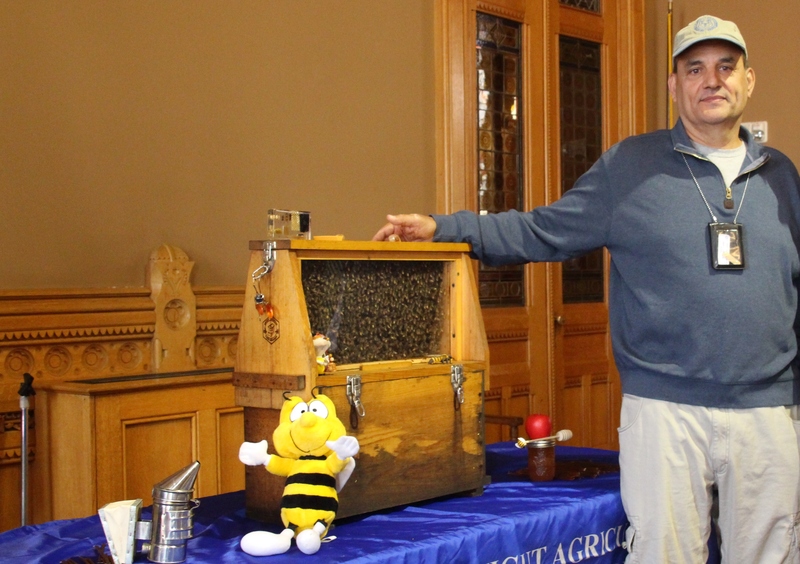 State Bee Inspector Mark Creighton, who works for the Connecticut Agricultural Experiment Station, brought a hive to the Capitol and said there are now more than 7,000 honeybee hives in this state and more than 1,300 beekeepers. In recent years, the decline in bees has caused great concern because of their importance to our crops of food and flowers. Bees are crucial to our environment and food production. In addition, many of you contacted me to voice your concerns about cuts to the Agricultural Experiment Station and possible elimination of the bee hive inspector position. I expressed concern in committee about that position, and joined my colleagues in support of legislation to support pollinators.